“We LOVE your product!! We have a large Equestrian Facility on grounds at the Phoenix Zoo that holds 23 head of Equine including 6 Draft Horses. We had a Percheron Draft that came in to us a somewhat a rescue, the poor guy had a really bad case of White Line Disease. Once we got the White line under control, we were having the issue of him just not growing enough hoof to keep him sound. With his weight of being a Draft working against us and not being able to shoe him his sole had started to drop. We really thought his hooves were going to be end of him as he had to be kept stalled up as his feet were too sore. My farrier was out of ideas as we have tried everything we could, I was searching for topical solutions for hoof growth on the internet and found you guys, and thought “we have tried everything else, so why not try.” My farrier and vet staff was very skeptical so we started it as an experiment and took pictures and measurements before we started. After just 3 weeks of applying it daily he grew a 1⁄2 inch!!! Everyone was shocked!! The new hoof growth is so much healthier and stronger; we are very pleased with the results. He is sound; we can get shoes on him, and can be used for little riding in our sand arena. 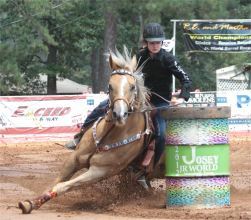 This horse just has the greatest disposition that I couldn’t give up on him, so I am very happy I stumbled over your product as it saved this horses life! 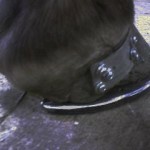 We have also started to use it on our Clydesdale just to improve his quality of hoof growth. We are well on our way to recovery when we didn’t think he could recover.” Thank you, again. Pictures above: I purchased a gelding that had a bad quarter crack on the inside of the left front hoof. 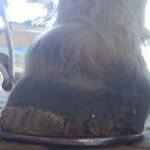 From the bottom of the heel, the crack extended the full length of the hoof and in to the coronet band. When his metal shoe was removed, I found the crack was the width of the shoe, as well! 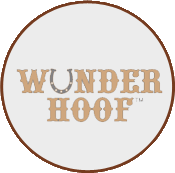 My farrier,Mike Loveland (Albion, MI) created a special shoe for my gelding’s foot; in addition I started using Wunder Hoof. We began the process at the end of March, hoping the special shoe would hold the heel together and the Wunder Hoof would speed up the new growth. The combination worked wonders! By the end of July I could start riding my gelding, and the Wunder Hoof daily application had grown the hoof out all but approx.1/2 inch. 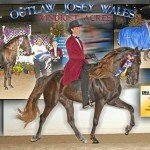 The hoof stayed strong and in September my gelding and I won two International Grand Championships!